Margaret Jenkins Dance Company in "Times Bones"
2013-2014 has been a celebratory season in Bay Area dance with many companies marking important and historic milestones. 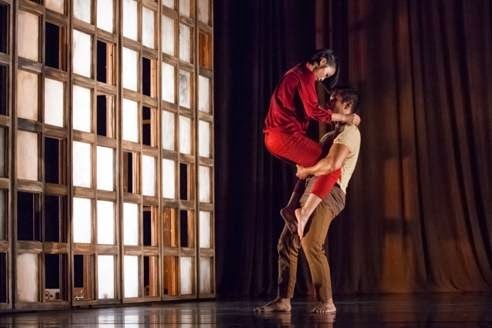 Margaret Jenkins Dance Company is certainly one of them; commemorating forty years of contemporary choreography and performance. That kind of artistic longevity is really something and it demands serious and significant recognition. The festivities began with a weekend of performances at Yerba Buena Center for the Arts - the West Coast premiere of 2013’s “Times Bones” and the world premiere of “The Gate of Winds”, a collaboration between Margaret Jenkins Dance Company and Kolben Dance Company. Collaboration in live performance brings with it a host of challenges and opportunities. And making a dance with two different companies (in this case, Margaret Jenkins Dance Company and Kolben Dance Company) is particularly unique. Keeping the special-ness of each group is important, yet there is a necessity to move forward together - to learn, grow and stretch boundaries. “The Gate of Winds”, a new collaboration choreographed and directed by Margaret Jenkins and Amir Kolben, got everything right. “The Gate of Winds” is a choreographic dissertation on motion. Whether pedestrian or stylized; unison or solo; allegro or lento; loud or quiet; aggressive or graceful, every type of motion was thoroughly tested and explored. Movement was almost constant onstage, in fact, there were very few instances of stillness in the forty-minute work. A percussive sequence mid-way through the dance deserves a special mention; a collection of phrases where feet, hands, vocals and breath took on a dual purpose: as a living score and the choreography at the same time. And “The Gate of Winds” perpetual motion continued right up until the end. The curtain was slowly lowered, while both companies continued the contemporary choreography, full-out and with abandon.